From September 2018 Lisa will be artist in residence at Mullard Space Science Laboratory (UCL) in Surrey. with painter Charlie Betts, we welcome you to the studio for a chat about ongoing projects with work for sale (some bargains too). Let me know if you need directions at lpettibone@btinternet.com. Set on the coast of Cornwall, this research trip will provide opportunities to gather imagery, stargaze with Lumen Studios and learn about the area’s historical links with 20th century communications. Organised by Lumen Studios and Mayes Creative. Entropy, Digitally printed on the front and screen printed pink fluorescent ink on reverse, cut and manipulated, 50 x 60 x 8cm. Artists exploring interpretations of unimaginable phenomena such as dark matter and gravitational waves. I'll be taking part in an artist residency with Lumen Studios (London) in Atina, Italy. The group have an interest in light and astronomy so I'll be studying the night sky and developing new work in an effort to find ways to merge my practice with science. Being part of a small community of artists and enjoying the clear mountain air will surely spark novel thoughts! A show of related work is planned at www.cryptgallery.org.uk, St Pancras, London on 5 November 2015. Leaving Home, Contemporary Applied Arts, London. ‘Offering’, produced for The Vyne, will be on display with other works commissioned by Unravelled Arts during their 5 year project working with the National Trust. International Festival of Glass Masterclass with Lisa Pettibone Adventures in Slumping: Capturing warm glass movement – moulds, ideas and inspiration. The Artful Gallery, Haselmere, Surrey. On the grounds of David Paynter’s fabulous house in Surrey, I will be showing work alongside several artists during Surrey Artists Open Studio. One Marylebone, NW1 4AQ. Contemporary craft at the magnificent Sir John Soane Church opposite Great Portland Street tube station. Lisa will be demonstrating in the glass area from 10–5.30 everyday and there will be a good selection of her work on display. 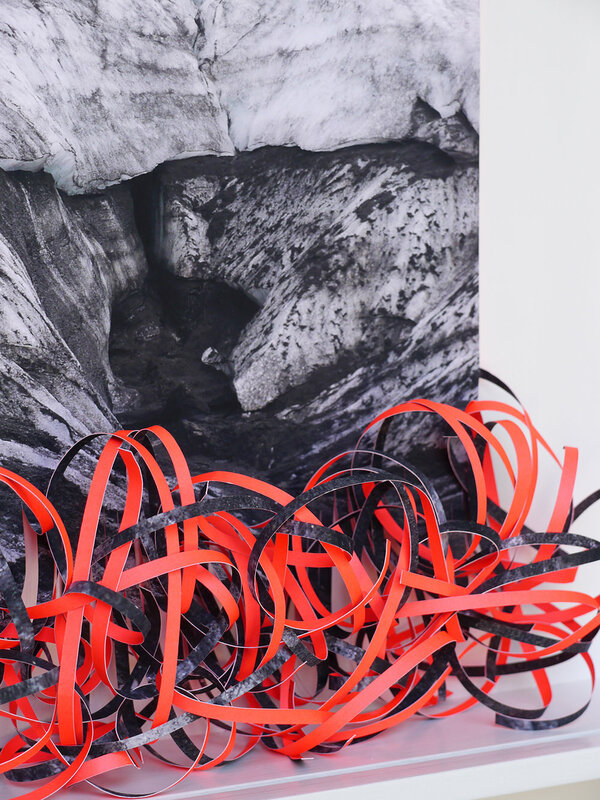 Lisa is pleased to announce that her piece ‘Bale’ will be included in the prestigious Corning Museum of Glass publication New Glass Review 35 in May 2014. Ten contemporary artists unravel a Tudor powerhouse at The Vyne, a National Trust Property. Aesthetica Art Prize Exhibition, selected for a long list of 100 artists out of over international 3000 entries, exhibited by projection with shortlisted entries at York St Marys, York. Come visit myself and Alison Catchlove (metalwork) at our workshop on Burrows Lea Farm, Shere, GU5 9QQ. We are part of an artists trail in the Surrey Hills area, collect a map while you're here. I'm also exhibiting outdoor work at Lingwood Samuel in Cranleigh, see SAOS brochure for details. Unravelled at The Vyne, near Basingstoke, Hampshire. I am placing a site-specific commission in the antechapel of this exceptional Tudor house (a National Trust property) along with nine other artists. Open 11– 4.30pm. Tilthams Corner Road, Godalmimg, GU7 3DE Tel: 01483 527 688. I have been selected to produce a site-specific piece for for 'Unravelling the National Trust: The Vyne', near Basingstoke, Hampshire. This is curated event commissioning artists and makers using or subverting the notion of craft in extreme and conceptual ways. Installation for 28 June 2013 for six months. Come visit me in my workshop on Burrows Lea Farm. Guest artist Angela Thames will also be showing her handmade books. I'll have a few outdoor sculptures, new wall pieces and prints on show. I am part of an artists trail in the Surrey Hills area, collect a map while you're here. After school art sessions for 8-11 year olds. Using the canal environment next to the gallery, we'll be exploring texture, shape and movement in nature. Using a range of sculptural media we'll create a fantastic temporary installation in front of the gallery for our final work. Group show at Guildford House Gallery, 155 High Street Guildford, Surrey GU1 3AJ 10-4.45 daily, closed Sunday, Christmas eve until 4pm. Awarded the Kentish Town Health Centre public sculpture commission. The sculpture will be situated in the patio entrance to the building and comprises three large curved glass panels. Her enamelled glass design based on the paisley pattern, celebrates the vibrant international community that use the centre. It will be installed in late November 2010. 10-13 and 18-19 from 11-5. Proposal selected for the Kentish Town Health Centre (London) public art commission. The sculpture will be located in the patio entrance and installation is scheduled for November 2010. Come see Nathalie Kamm (ceramacist) and myself in our workshop. Installation in the gardens at Marle Place, Brenchley, Kent. 300 metres of plastic stretched between an avenue of mature lime trees.